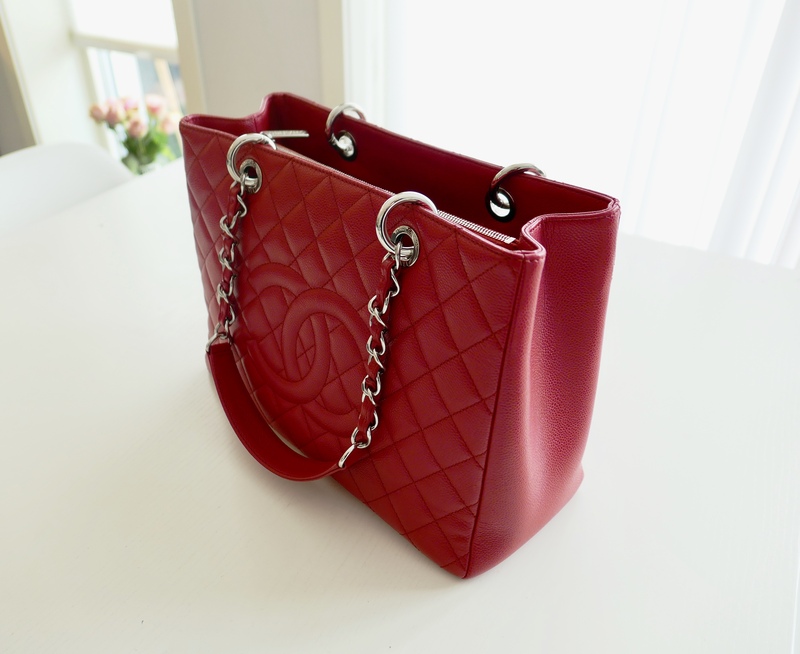 I will do reviews here on pursesandpugs. Mainly of handbags I have in my collection, but also of other types of accessories. 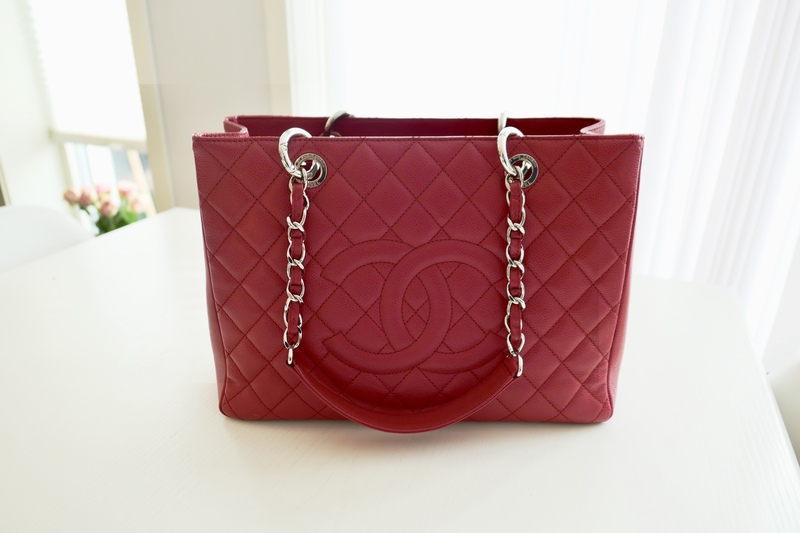 First up will be a review of my Chanel Grand Shopping Tote (GST). Why reviews? When buying something designer, new or pre-loved, I always do my research first. In fact, that is half the fun in the hunt for something new. And if you can’t go into an actual store and inspect the item, because you don’t have that kind of store nearby or the item is no longer in production, the Internet is your best friend. I always find it helpful to find reviews of things I’m interested in, especially from someone who actually owns it and has used it for a while. 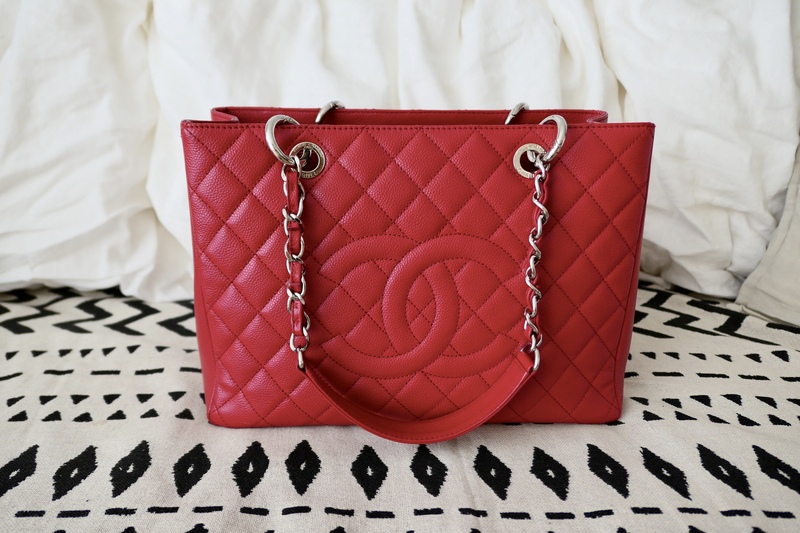 I have considered the Chanel GST for years as an everyday tote bag. I looks nice in black or beige, but my dream GST was always a true red with silver hardware. That combo seemed to be a unicorn though, and when Chanel discontinued the GST in 2015 I kind of gave up. I considered other types of tote bags, but was still drawn to the GST even though I’ve read they could get saggy after a while and slip easily off the shoulder. Then one day my exact dream GST suddenly popped up. Pre-loved from 2012, but in pristine condition. 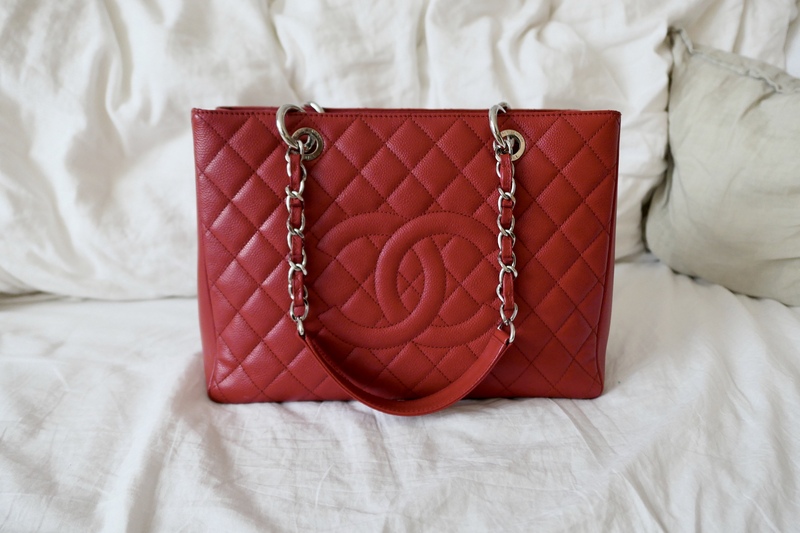 I jumped right on it and after a few months of use, here is what I think of the Chanel GST. The GST is a boxy and structured tote bag. 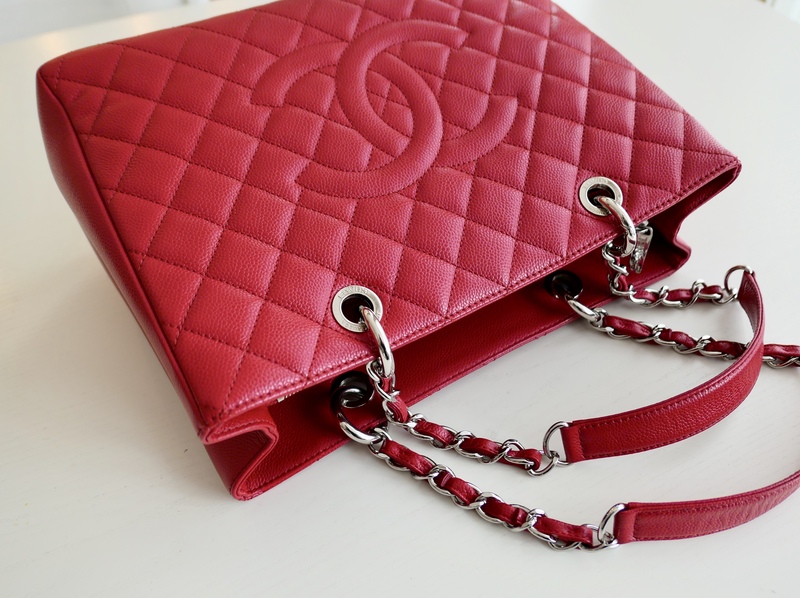 It has several of the iconic Chanel elements, such as the diamond quilt, leather chain strap handles and a slip pocket on the back. A large CC logo is sewn in at the front. Inside the bag there are two large main compartments and one zippered middle compartment. The front compartment has a slip pocket and the back compartment has a zip pocket and a key holder strap. The interior is lined with a satin-ish type of fabric. 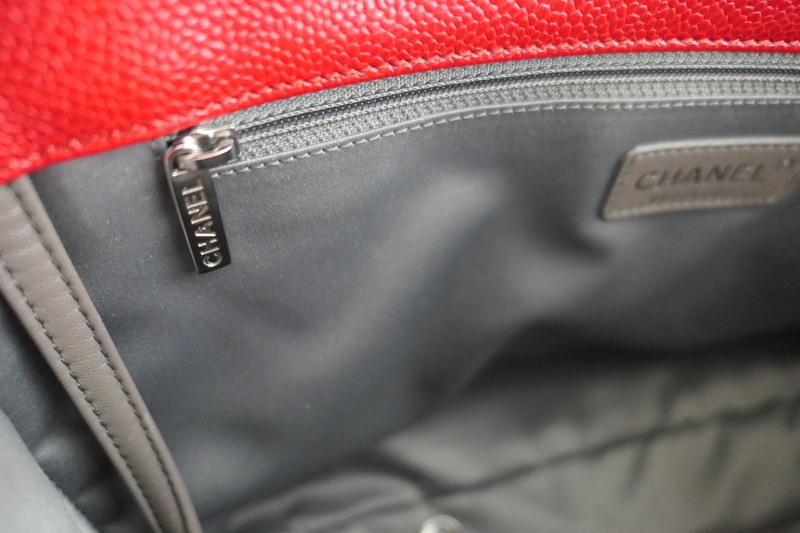 The zipper pulls are rectangular with “Chanel” engraved on one side and “CC” on the other side. 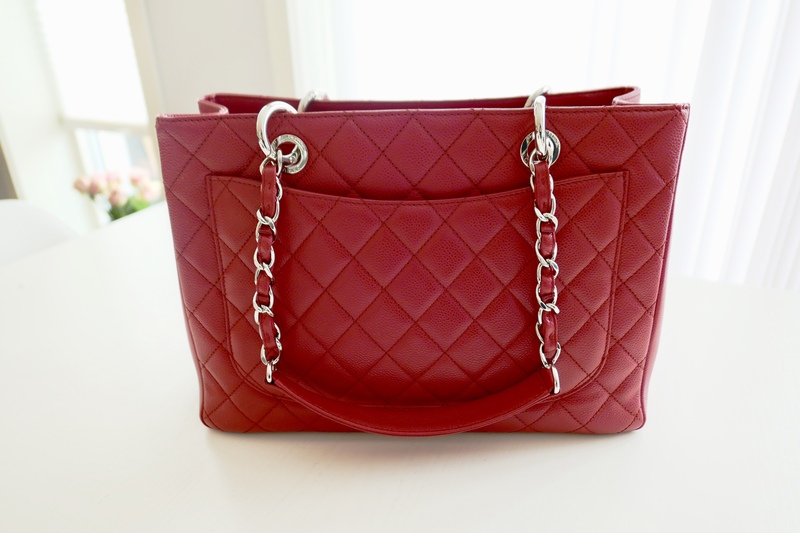 This is a very elegant tote bag with a classic Chanel appearance. I absolutely love how it looks. But an issue with the GST is that the bottom may sag over time, especially if you carried it frequently with heavy items. A little sagging is OK, which probably happen to most GSTs, but I don’t care for a very saggy one because it loses its boxy shape. My bag is from 2012 and is gently used, but I can see a small tendency at the bottom corners. I don’t worry about it too much though. Storing it carefully stuffed with tissue paper and making sure it’s not too heavily packed is key. The bag can be handheld or carried on the shoulder. It doesn’t have a crossbody option. The handles consist of the classic leather chains with leather sections on top. This is both a pro and a con. The leather sections make it more comfortable to carry compared to a classic flap where the leather chain straps may dig into your shoulder, but they can also make the handles slip off more easily. This has not been a major issue for me though. So far I have carried the bag with a jacket or coat, so maybe that helps. 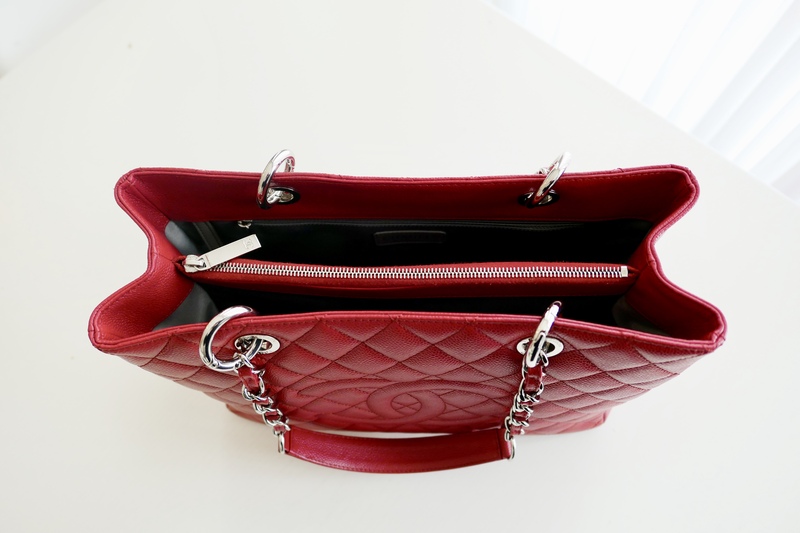 The two main compartments make it easy to grab the things you use most frequently, and they can easily fit larger items like a scarf or an umbrella. 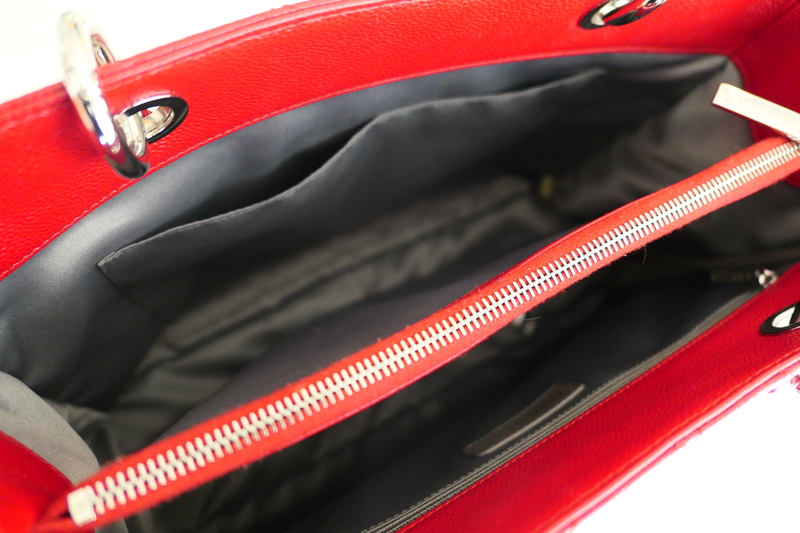 The middle zipper compartment is narrow, but is great for more valuable items. You can put a wallet, passport or even an iPad in here. The key holder strap is a great little asset. If you throw your keys in a big bag, they’ll be the last thing you find when you need them again. We’ve all been there. If you attach your keys to this strap you can just pull up the strap whenever you need them. Another plus is that you don’t have to worry about losing your keys since they’re attached to the bag. The outside iconic slip pocket on the back is also a major plus. I use these pockets on my Chanel bags for smaller items. On the GST this pocket is HUGE and therefore you can easily fit your phone or other items as long as they are on the narrow side. From a practical point of view, it can’t get any better. The way this bag is designed inside makes it easy to find what you are looking for, as long as you remember in which pocket you put them. I would say this is a medium weight tote bag. It’s not as heavy as a Celine Luggage tote, but heavier than a Balenciaga classic City or even a Work (but then again Balenciaga are famous for their lightweight bags). To be honest, the weight didn’t even occur to me until I wrote this review, so it’s definitely not a big issue. From what I can tell from my own bag, which is from 2012, it’s very durable. It has been gently used and stored carefully, but still, it holds up very well. I can’t see any marks or wear, only minor sagging at the bottom which probably will happen to most GSTs. I wouldn’t recommend getting a large bag like this in lambskin though, because lambskin is a delicate leather that easily shows wear. If you get it in caviar leather, use it wisely and store it the right way, it will look great for many years. Hands down, I love the GST! It’s an elegant and classic looking tote bag that’s practical and easy to use. And although I love a good crossbody bag, it’s easy to carry it on the shoulder or by hand. Also the price isn’t that crazy. Yes, Chanel prices are undoubtably crazy, but the GST isn’t that bad compared to other models, especially the classics. This is a large bag so you get a lot of leather for your money. If you’re looking for a practical and classic tote bag and don’t need a crossbody option, this is it. The only major downside is that Chanel discontinued the GST in 2015. 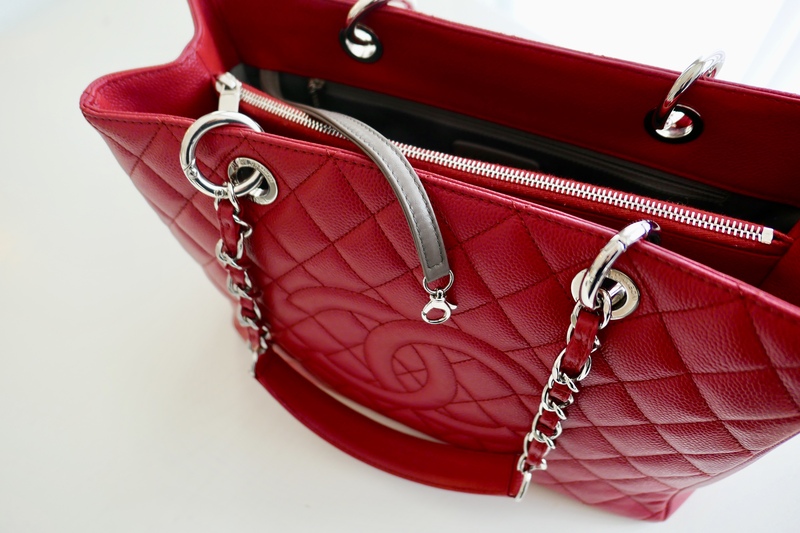 This is a mystery to many handbag enthusiasts, as this is a very popular bag. But you never know, one day they may bring it back. Meanwhile you have to buy it pre-loved if you want one, just like I did. Thank you, so happy to hear! Thanks a lot for your detailed review – I really enjoyed reading it and look forward to your next posts ? Just came across your blog and I love it!!! I love Chanel bags and was also after a GST — but also a factor to consider re durability, some GST owners have found the metal rings can possibly break suddenly during normal use and the strap and essentially the whole bag is useless until the ring is replaced! Thank you for your lovely words! And thanks for enlighten me about the metal rings, I didn’t know… Yikes!! Crossing fingers it will not happen to my bag. Hello Anne Mari, came across your blog in search of this beautiful bag. I have no luck in days. Do you mind sharing the website where you bought this? Have a great weekend! Yes, they are hard to come by now after they’re discontinued. Wish you good luck!